O2 as part of its on-going tie up with Star wars wanted to give away ten pairs of tickets to Star Wars fans across the UK. 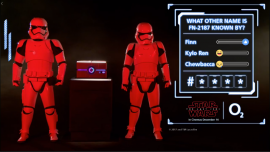 The Facebook Live stream featured two Stormtroopers guarding an imperial box containing the premiere tickets. In each ten minute competition cycle the audience was asked a trivia question which they could pick one of three correct answers for by voting. Once a correct answer was received one letter of a four letter code to open the box was revealed. Viewers then had two minutes to comment to guess the code. Once the window for entries closed, our Groovy Gecko Competition tool was able to sort all the winners and then randomly select a winner. The tool ensures no-one can cheat and only a viewer’s first answer is used. The winner’s name could then be displayed on-screen. Viewers would then see a small piece of Last Jedi video content while the game reset and the next pair of tickets could be competed for. Overall over 179,000 viewers submitted more than 78,000 comments which is particularly impressive as this stream was delivered in the middle of a week day. The on-demand version of the competition can be seen here.